MIY Workshop is now located in sunny Sheffield in the foothills of the glorious Peak District. Classes are temporarily on hold, but all blogging, pattern designing and book writing activities will carry on as usual. 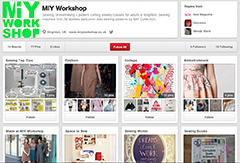 Plans are afoot to bring the magic of MIY Workshop sewing classes to the north. Watch this space for developments! Hello my name is Alice I am selling my industrial machine WIMSEW W-C11103. I bought just 3 month ago in London from a machinist enginer. Work perfectly. I am moving to a new place I cannot keep it. Would you be interested in the machine. I pay 350 pounds + the transport from London ( cost me more than the machine). I am sellling that for 300 or ONO. Hi – I have a voucher for 125 which needs tone used before December 10th. I was hoping to do a one day course. Is the next one in January? Is there space and can I still use my voucher for this? And will I be able to spend the excess? Hi Donna, I’ve just sent you an email.